Home » Industry » Analytics » Annual Report Season Scoreboard: What Grows and What Does Not? The latest report from Outsell Inc. estimates that the total information industry grew by 3.3% in 2012 to US$506 billion. The growth of the credit & financial information segment grew by 6%. The company information segment grew also by 6%. We have added this as a benchmark to our earnings growth chart above (see green bar). Rating Agencies have taken the lead in showing an incredible revenue and income growth in ratings and analytics. Thomson Reuters Governance, Risk & Compliance Unit raked up an impressive growth of 22% for the quarter (and 42% for the full year). FICO return to growth through acquisitions. Verisk Analytics said its revenue growth in the fourth quarter was driven by a 28.7% increase in Decision Analytics. Consumer credit information performed well, while D&B’s commercial credit information services remained disappointingly stagnant. Acxiom and Harte Hanks revenues also declined. Bisnode reported lower revenues in marketing services offset by growth in credit information services. 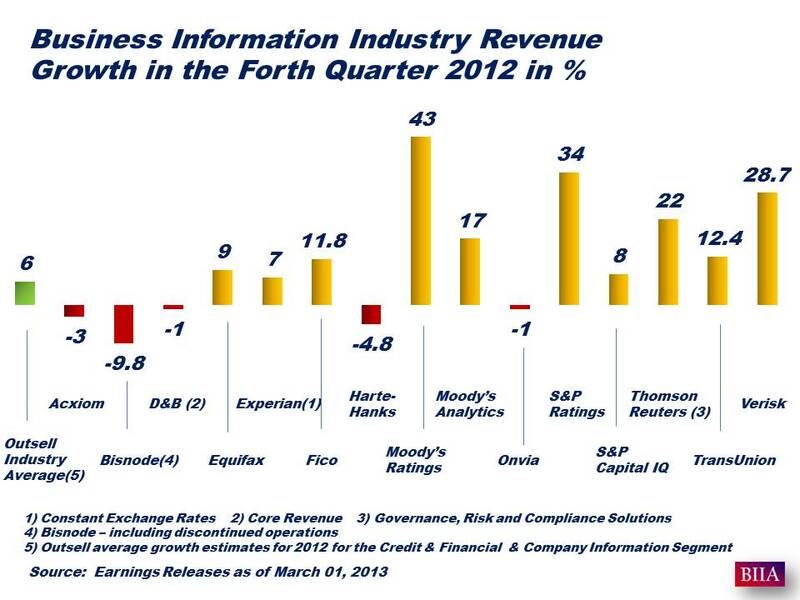 The overall decline in revenues reflects the divestiture of product related information services. We have added Onvia Inc., a small public company which tracks, analyzes and reports the spending of tens of thousands of federal, state and local government agencies, giving companies a single source for conducting open, intelligent and efficient business with government.